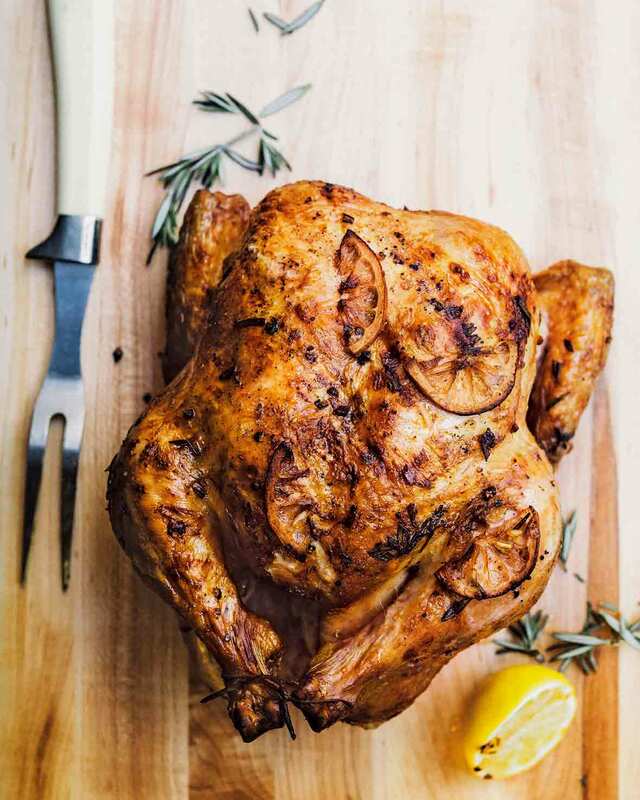 This whole grilled chicken is first brined, then rubbed with a paste of lemon, rosemary, and garlic, and finally grilled. It’s an easy dinner for backyard barbecues. And it’s gonna ruin roast chicken for you forever. 1. Whisk together the water and salt in an 8-quart or larger container. Add the chicken, cover, and refrigerate for at least 12 hours and up to 24 hours. 2. Soak the wood chips, if using, in water for 30 minutes. 3. If using a charcoal grill, about 1 hour before grilling the chicken, set up your grill for indirect grilling (which basically means putting the pile of coals on one side and nothing on the other side). If using a gas grill, about 20 minutes before grilling the chicken, heat your grill to 250°F to 300°F (121°C to 149°C), or medium-low. 4. Combine the lemon slices, rosemary, garlic, oil, and pepper in a food processor or mortar or molcajete or a heavy bowl and use a pestle or back of a wooden spoon to slowly but firmly mash the ingredients together until pulpy and mushy. Remove the chicken from the brine, rinse under cold water, and pat dry with paper towels. Rub the lemon mixture onto the skin and let stand at room temperature for 15 minutes. 5. Place the chicken on the grill directly over the heat. Grill 7 minutes or until grill marks and some charring appear; turn chicken over, and grill 7 more minutes. Using tongs, move the chicken to the cool side of the grill. If using wood chips, sprinkle them over the hot coals or fashion them into a packet made of aluminum foil and pierce the packet several times. Grill, covered with grill lid, 1 to 1 1/2 hours or until a meat thermometer inserted into thickest portion registers 165°F (74°C). (A meat thermometer is essential when cooking a whole bird. The best place to check the chicken’s internal temperature is where the thigh meets the body of the bird. Insert the thermometer deep into the meat, close to the bone.) Remove the chicken from the grill and let it stand 10 minutes before carving and serving. 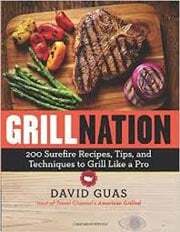 Whole Grilled Chicken Recipe © 2015 David Guas. Photo © 2015 Johnny Autry. All rights reserved. All recipes and photos used with permission of the publisher. This whole grilled chicken was fantastic! Brining the chicken kept it really moist, and the flavor of the lemon and rosemary was really lovely. I brined the bird for 16 hours, drained it, patted it dry, and let it sit in the fridge for 4 more hours before continuing with the recipe. I used a gas grill, and instead of sprinkling the apple chips around the grill, I soaked them in water for 30 minutes, wrapped them in a foil pouch, and poked several holes in the pouch. I put it on the grill next to the chicken for the whole cooking time. The flavor from the smoke was subtle, but it did impart a lovely coloring to the meat of the chicken. Fantastic recipe! I had been perfectly content grilling cuts of meat, including beef, chicken, and pork, until now. But I am utterly impressed with the juiciness of this whole grilled chicken. I can't wait to try my classic tandoori chicken recipe with this cooking method. I smashed the garlic, rosemary, and lemon to a mashed guacamole consistency. (Did I mention I adore lemon and rosemary?) The Indian in me can't resist brining or marinating anything for less than 24 hours. So 24 hours it was. Since our gas grill doesn't have a temperature gauge, we kept it to "smoke" indicator. Took us closer to 1 hour and 45 minutes to cook it to 165°F. Either way, it was worth the wait. Ultra moist and flavorful—truly a weekend winner. The flavoring is classic. Looking forward to grilling chicken using this method with my own spice mixture soon. You never fail to post the most amazing recipes. Haven’t made a single thing of yours yet that we didn’t LOVE. Thank you for sharing your love of cooking, food, and especially your recipes, with the rest of us. Shannon, you bet. It’s my pleasure! Simply amazing! And easy!! Can’t wait to make it again! Wonderful, Denise! Thanks so much for taking the time to let us know! Looking forward to hearing which recipe on the site you try next…we test all recipes that we’re considering putting on the site and only those that are truly easy and memorable in the best possible ways make it onto the site. So you can make all of them with the same confidence you made this whole grilled chicken. I am making this tomorrow night. Wondering if anyone has done this on the grill rotisserie? Linda, we haven’t, but I think it would be perfectly fine.